How are you on this lovely Thursday? Today was another rough one with Jet lag and all, but I managed through. Since my trip to Europe I have been craving carbs, horribly. 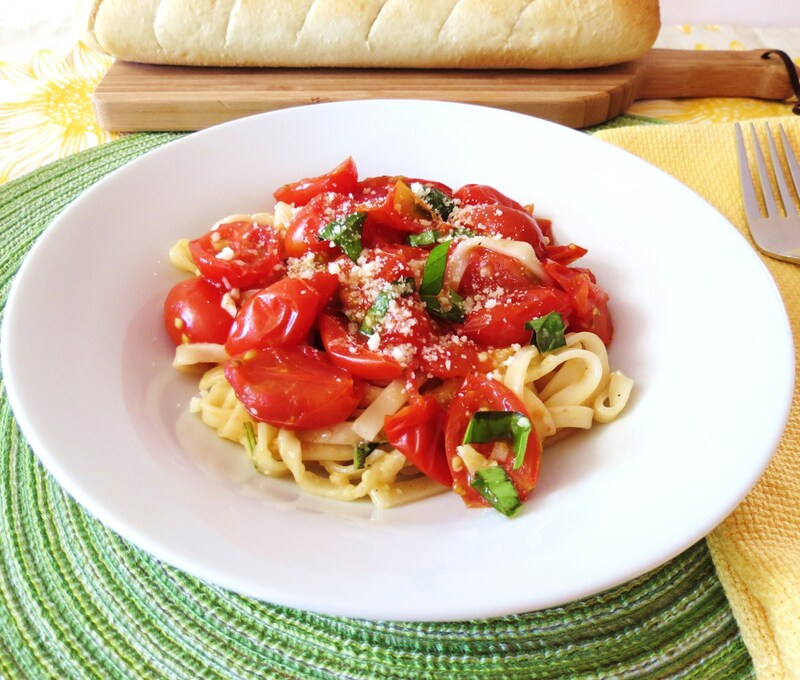 I never used to crave carbs like I am right now, and I felt the need to feed my carbs, so I made this wonderful light pasta dish. 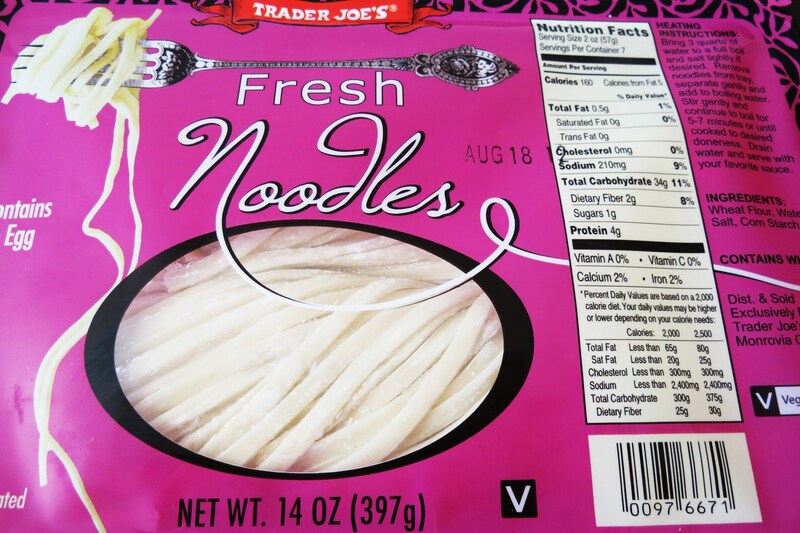 I was at Trader Joe’s the other day and they now carry fresh pasta, and I just had to try it. I love it,! But the only thing is, the pasta cooks quicker then the instructions say. So if you buy it, keep an eye on the pasta, mine took about 4 minutes to cook. I decided to roast my tomatoes instead of using a sauce. Have you ever roasted tomatoes? If you haven’t you must! The flavor is unbelievable! All I did was cut 2 cups of cherry tomatoes in half, add some garlic, salt, pepper and olive oil and placed in a 450 degree oven for 10 minutes. Dinner took about 15 minutes to make total. Not to shabby for a weeknight meal. I served my pasta with Alexia Garlic Bread and a simple side salad. It was perfect and filling. I tried to control myself with the bread, so I stuck to two slices, which is one serving. I love Alexia’s Garlic Bread, it tastes so fresh. When I was in Germany there was a cute little Italian Restaurant behind the gas station in a park and I had a pasta dish there it was amazing! I couldn’t get it out of my head so I had to re-create it at home. I don’t think I did to bad!! 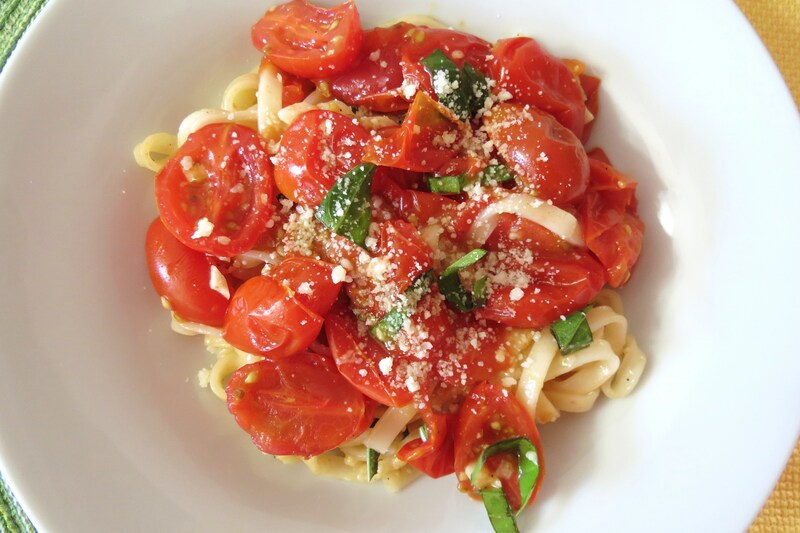 A light pasta dish made with roasted tomatoes and garlic, tossed with Parmesan Cheese and fresh basil. 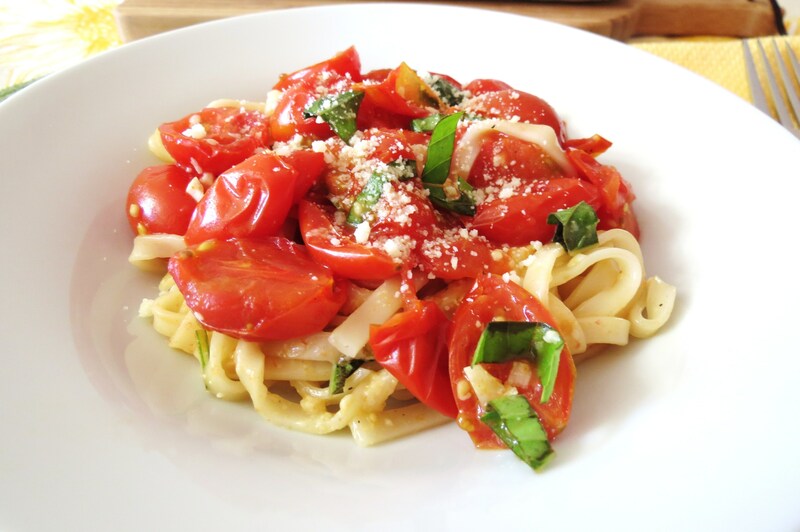 Cut cherry tomatoes in half and place in a bowl with garlic and olive oil. Add salt & pepper; toss until tomatoes are coated with olive oil. Place tomatoes on prepared baking sheet and bake for 10 minutes. Meanwhile cook your pasta according to manufacturer directions. Once pasta is cooked, drain and place in a bowl. 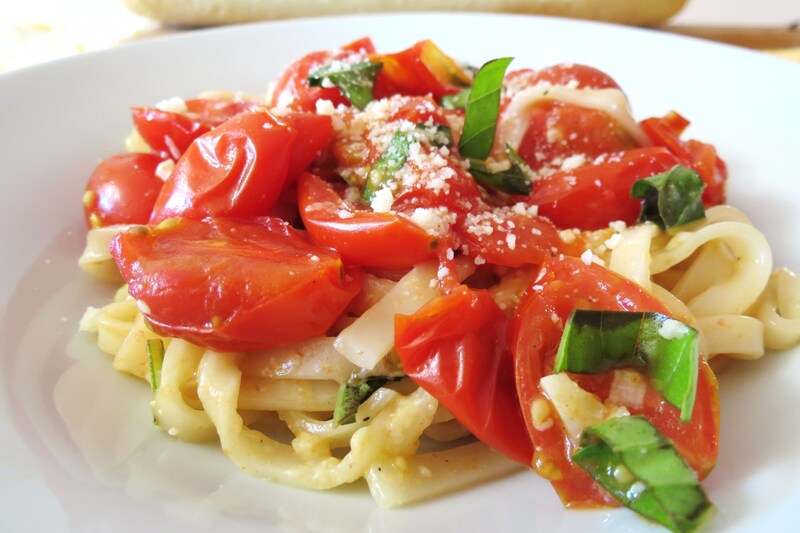 Add tomato mixture, fresh basil and Parmesan cheese. My poor Husband has been living on potato chips and hot dogs for the past week, and I am sure he is craving a meat and potatoes kind of meal, yet I am craving light vegetable dishes. I didn’t find vegetable dishes so plentiful in Europe and besides the carb craving, I have been wanting fresh veggies. Tomorrow I’ll make my Hubby his meat! I hope you have a great day, I am counting down the minutes to the weekend. I have no plans, but to sleep in a little. See ya tomorrow! I adore roasted tomatoes, this looks fabulous. And I must try those noodles, I love TJ’s! I love roasted tomatoes too and there so good this time of year. Nothing beats it!! I need to try those noodles! This looks delicious! I love the noodles! There so simple and good and cook super fast!! Yummm…just found your blog….so glad I did! Can’t wait to try this! I’m glad you found me! If you make it, stop back and let me know what you think! The noodles are so good, tastes freshly made!!! You have to try them! Love roasted tomatoes! This dish look delicious. Cannot wait to try it!! 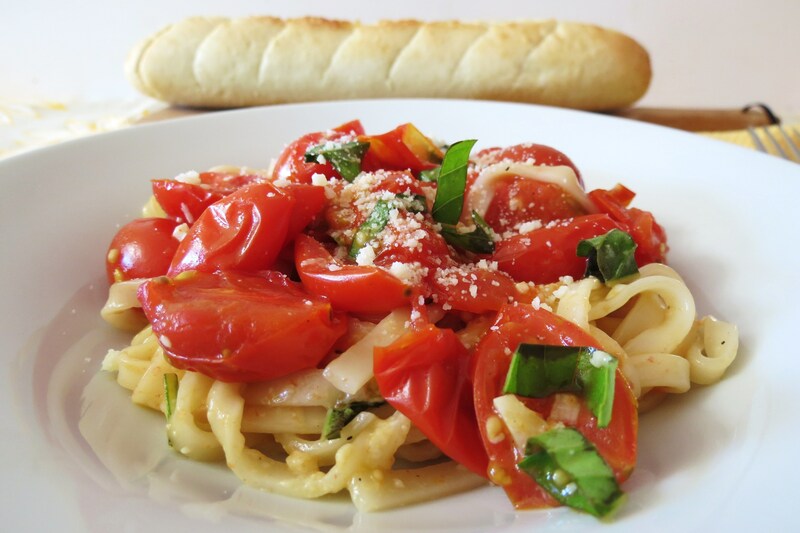 What a delicious looking pasta dish, I’m so happy to know about the fresh pasta a TJ’s – I hadn’t noticed it yet, yum! You have to check out there fresh pasta, I’m pretty impressed with it! It’s located near there fresh pizza dough. This is so good!I added hot pepper flakes!I like a little heat.Thanks for such an easy light recipe,but ohh so delicious! I am with you! I also added hot pepper flakes to mine too!! I just omit it on the families! So glad you liked it! !